Superponics is the technology of growing plant using a combination of more than one of the many hydroponics technologies that are available into a single unit for maximum growth. In the hydroponics system, the nutrients are added to the water and the plants grow in these nutrient solutions. When the nutrient level in the hydroponics system becomes very dilute, more nutrients are added to the same water. So the water is reused by replenishing the water with more nutrients. There are six basic types of hydroponics system. The hydroponics system will provide the necessary nutrients. Water, oxygen and nutrients which are all essential for the plant growth are supplied through the hydroponics system. Each of the six hydroponics systems have different methods of delivering these nutrients to the plants. The use of more than one hydroponic system is a technique of ensuring proper nutrition to the growing plants and helping in faster growth when compared to growing plants using a single hydroponic technology. Using the superpoincs system of watering, the plants are said to grow up to 5 times faster, safer and easier than the traditional type of watering systems. Even when one of the hydroponic grow systems fails, the other systems will continue to function. Hence the plants will continue to grow. Supercloset is the manufacturer of the grow systems that works on Superponics. Supercloset growing uses a combination of three very good hydroponics systems namely, Automatic top feed, Deep water culture and Bubble and aeroponics. They have many products that work with this technology. The main Superponics products are Superponics 8 plant system, Superponics 16 plant system, Supercloner 14, and Supercloner 50. The numbers specify the number of plants or seedlings it can hold. All these Superponics systems are adopting the top feed watering, deep water culture, and aeroponics for better and faster growth of the plants. The system being automatic saves much time and only monitoring will be enough. The water in the reservoir must be changed in 1-2 weeks. A TDS meter will help check the nutrient level in the water and the pH must be kept neutral. Superponics is easy to use, effective, and consistent with the yield. The growth rate can be increased by providing CO2. All these Superponics systems have been used in many growing boxes, chambers, and closets. This Superponics system can hold 8 growing plants of any one growth stage. This system includes durable and easy to clean reservoir with lid. It is connected to a pump and other watering system. It come fully assembled and just need to plug in and switch on. The air pump and air stones provide oxygen. The plants will grow in the 8 net pots. The Superponics 8 plant system of Superponics can hold 8 plants at a time from a young stage till it is fully grown. The Superponics uses automated top feed by dripping the nutrient water over the root system, deep water culture where the root system can grow deep in the container, bubble and aeroponics where the nutrient rich water is bubbled up and reaches the top of the root system and bursts the bubbles providing a mist of nutrient in the air around the roots. The root of the growing plants is in constant touch with the nutrients thus helping in faster growth. Any problem with one technique will not affect the plants at all. 8 2” net cups are provided to hold the plants and rock wools or clay rocks for the root support. Water pump for regular watering and an air pump for oxygenation also comes with the package. The capacity of the water pump is 132 gph. The water pump is very powerful but at the same time quiet. When this is connected to the timer, the plants are supplied water and nutrients at the correct time. All the watering is done automatically with the help of a timer. The timer can be set as per our convenience and we can sit back and see the plants being watered. This feature is very convenient when going on vacations or other official tours. The timer will ensure proper watering of the plants. The whole plant system can be covered by a tent and supplied with light system and air circulation. An efficient carbon filter can keep the air clean inside the tent. TechnaFlora Recipe For Success 10 Part Nutrient System. This kit has all the necessary nutrients with instructions on how to mix the various products, the raio of mixing them to get the maximum benefit for all the growing stages of the plant. pH Testing Kit is a General electronics hydroponic kit which ensures that the pH level of the nutrients are all maintained in the correct level. TDS Meter stands for total dissolved solids meter. It comes with a LCD screen which displays a color chart which tests the water suitability and also the level of nutients in the hydroponics system. 1” Rock Wool Cubes are made of spun granite and wicks. Roots grow well in this medium and it acts as a strong foundation for these roots. Hydroton Clay Stone Medium is a course, porous and absorbent material through which the roots will grow well and also become stable. Superponics 16 Plant System can hold 16 growing plants at a time. The plants are well taken care by the efficient watering system. Since the nutrients are carried by the water nutrition also is taken care of. The system is sturdy and durable. This is the best option for starting an indoor gardening. The Superponics used here is a mix of top feed drip system, deep water culture, and bubbleponics. The top feed drip system will provide a constant supply of dripping water from the top just above the roots. The regular contact with the nutrients makes the plant growth faster and more number of harvesting is possible. The success of Superponics is the individual efforts of each watering method. All these methods are independent of each other so that in case one does not work properly the plants make use of the other two methods. The plants will grow faster and the yield will be huge when compared to other hydroponics systems that work on only one method. This Superponics 16 plant system will fit into any kind of grow tents. The whole box is sturdy and UV stable. This 16 plant superponics system is very easy to clean and manage. The size of the system is 28” long, 12” in height and 20” wide. The hydroponic system is the best of its kind and can hold upto 20 galllons of nutrients. The 16 Plant superponics system comes with a three year warranty and is also supplied with a manual with complete instructions. Supercloner 14 is a 14 site cloner that is useful in germination, cloning or rooting of the vegetative parts from the plants. The plants are allowed to grow about 2 feet in height. The reservoir is sturdy and has a lid. The air pump and air stones provide enough oxygen. The Supercloner will help clone, germinate or vegetate the plants. The root growth is rapid and luch white colored roots are developed easily with the help of the cloning gel. The cloning gel works better than the rooting hormone. The roots are always in a moist environment and supplied with nutrients anytime they want like. The bubbleponics provide the necessary oxygen that is burst when comes to the surface, making it a complete fool proof growing system. This way failure in one method will not affect the plants as they have other methods to rely upon. But do not forget to change the water weekly once or once in two weeks. The system is durable and easy to clean as well. The package comes as fully assembled and need just plug-in to start. Keep check on the nutrients in water and the water ph for better cloning. When all is set, simply sit back and enjoy the plant rooting. Supercloner 50: The Supercloner can hold 50 seeds, seedlings, or vegetative parts that need some roots to be a new plant. This can be used for germination, cloning and vegetate the plant parts. It provides fast rooting for the seedlings or vegetative parts of the plants and can allow the plants to grow up to 2 ft in height. The glass dome will not allow the plants to grow beyond that. This Superponics system has a reservoir with lid. The system is connected to the water and air pumps and is automated. There is also an air diffuser for the germinating seeds or seedlings. The cloning gel provides the nutrition for the seeds. The gel will help in rapid root development so that the seedlings are grown fast enough to be transferred to the vegetative chamber for further growth. The cloning gel can be applied on the cut surfaces for the vegetative cloning. This Supercloner can allow the clones to grow into plants of up to 2 ft in height, when needed. Don’t hesitate to grow the plants till harvest but only if you can’t help it. but remember that the plants will deep root system will not fit in this. Small herbs or plants that has short root will definitely suit on this Supercloner. 10 exceptional nutrients at unbelievably affordable package! That is what makes the technaflora recipe for success kit. This starter kit works great for both newbies and experienced gardeners. It contains all the necessary components that you need to get rich bloom in abundant. This recipe is beneficial for both hydroponic and traditional gardening. Technaflora recipe for success works on stage to stage plant cycle formula instead of week to week. This eliminates guess work for you. Right from the germinating stage to the harvest stage, the Recipe for sucess provides you with all the necessary information on how to mix your nutrients. This will give you successful gardening with absolute ease. For the vegetative and flowering stage, it is always recommended by technaflora to add the B.C. Boost first in the reservoir. This is because it contains high amount of calcium and iron. They tend to blend with other elements in B.C. Grow and B.C. Bloom that can spoil the products and your herbage. Hence, it is recommended to dilute it in water initially for best benefits. Many indoor and outdoor gardeners have used technaflora recipe for success. Few users are a regular fan of technaflora and have been using it for more than 3-4 years. They have seen a steady flow of growth in their yields. A bunch of users use Technaflora with blend of other nutrients and are still reaping benefits. The price is just right without making you rob a bank. A general consensus of beginners love the product. They claim it is quite easy to use. The mixing instructions are quite helpful especially for beginners who are unaware of how things work. But just like any other product, technaflora has received its share of bashing as well. Though comparatively only a minor amount, there are few complaints for RFS. People claim that the package delivered was messy with bottle leaking nutrients all over the package. Another user claimed that the dosage recommended by technaflora is of a higher amount compared to other nutrient brands. The price too has been seen as a challenge by some. How does superponic 16 work for me? The superponic 16 hydroponic system promises to grow healthy yields 5x faster than soil growing methods. A patent awating product, Superponic 16 is custom molded and absoultely easy to clean. A fully assembled product, all the equipments especially the clone holder comes with UV food grade plastic that is absolutely safe to use and does not emit any toxic chemicals. What is superponics 8 plant hydroponics system? The superponics hydroponic system is an innovative technology from Supercloset that merges all the hydroponic growing methods into one such as deep water culture, bubble and aeroponics, top feed etc. so as to deliver faster, bigger and healthier yields without compromising on quality. How does a superponics grow box work? The superponics grow box from supercloset features the new invented superponic hydroponic system that promises to grow plants at a rapid rate challenging the ol’ conventional gardening methods. Grow indoors all seasons with superponics grow box that is absolutely stealth and comes with strong cabinet (lock and key) that can not only keeps prying neighbors away but rodents too. Is superponics available in Australia, UK, Canada and other countries? Yes, Superponics is available worldwide so if you are planning to grow with superponics, you can order your cabinet right away. Can I grow cannabis in superponics 8 plant grow hydroponic system? You can grow anything in superponics irrespective of the season outside. Be it flowers or cannabis or veggies of your choice, superponics features tested hydroponic methods that will deliver you promising results all through the year. Is there superponics grow closet available? 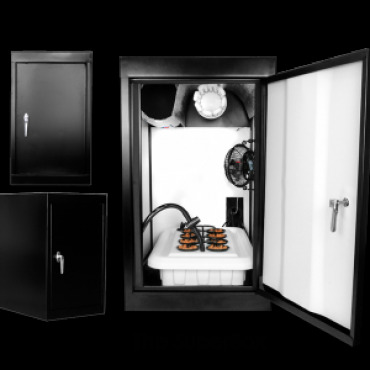 Of course, you can either buy the superponics system individually or you can order a complete grow closet (cabinet) that is easily assembled so that you can simply plug in and start growing. Are there any superponics grow journal available online to know more about the product? 420magazine.com is one of the prominent online websites that covers all the info you need regarding gardening and growing indoors with hydroponic system. What is a superponics rollitup? If you are beginner or if you have any queries, then rollitup.org is a forum where you can throw questions on other gardeners and experts regarding any clarification on indoor/outdoor gardening. Are there any superponics video available in youtube? Of course, there are many superponics videos from various users who will give you a clear perspective of how the product works for you. How much water level should be maintained in the superponics 8 plant hydroponics system? Just maintain a good water level at the reservoir and that should do. If you are having a 15 gallon reservoir make sure the water, nutrients and pH balance are maintained at a stable level so as to ease down the work of your superponics 8 or 16 plant hydroponic system. Since the superponics is fully automated you need not worry about watering the plants as it will take care of the watering at regular intervals. Will I get good yields out of superponics 8 plant hydroponic grow system? If you are maintaining a good pH balance, changing the reservoir water every couple of weeks, feeding organic nutrients, then you need not worry about getting good yields as superponics will take care of rest of the gardening process. How does superponics 16 hydroponic system work? The Superponics 16 hydroponic system operates combining all the hydroponic methods such as top feed, deep water culture, bubble & aeroponics which will deliver you best yields that are 3-5x bigger and faster than traditional growing methods. The best feature is you need not set aside time for growing plants as all the functions are conducted with the help of automated timer that takes care of your precious babies. What is the best way to germinate seeds in superponics 16 plant hydroponic system? You can either buy your own soilless medium or go in with rockwool cubes and clay grow rocks that are included with the superponics 16 plant hydroponic system. Simply insert the seeds to the soilless medium for rapid germination. What is the warranty period of superponics 16 plant hydroponic system? The products of supercloset comes with 3 year warranty, lifetime customer service and 24×7 customer support. So in case you have any queries or need a helping hand, supercloset delivers you with some of the best skilled team at your doorstep. Are there any reviews for superponics 16 plant or 8 hydroponic grow system? Supercloset has received many reviews from users who have been using hydroponic system and are probably in their 3rd to 4th cycle of healthy harvest. Many users have noted not only some of the best yields but also little difference in their power bills. I am going on vacation for a week. How can I keep my plants alive in the superponics 8 plant system? All you have to do is fill the reservoir and maintain the nutrient level. The superponics 16 plant hydroponics system will take of the rest. With timer, you have your own gardener who will take care of watering the plants even at times you are not at home. What does the upgrade package of superponics 16 include? If you upgrade the package of superponics 16 hydroponic system, you will be getting nutrient kit, pH control kit, soilless medium, TDS meter etc. for gardening success. Why do I need the TDS Meter with the superponics 8 plant hydroponic system? The TDS (Total Dissolved Solids) meter is necessary for determining the concentration of water and whether it is suitable for superponics 8 plant hydroponic system. It will also detect the ionized content in the water and the level of nutrients that needs to be added as per the water mineral content.